by Israel - continues to grow. “…Who is in control of the media. The fact that Israel comes out with these predictions about Iran developing a nuclear weapon that then never materializes; that this has taken place. The fact that Israel is acting as gatekeeper for this information means she’s not going to explore why their leaders have been proven wrong time and again. So, the more important thing that I think we need to keep in mind throughout this entire discussion, particularly involving Israel acquiring yet another modern submarine that is capable of launching nuclear weapons is that Israel is the only country in the world that has a part of its ‘nuclear deterrent doctrine’ ­ if you want to even call it that ­ the very public threat that she would be willing to use nuclear weapons against the entire world, in the event that she felt substantially threatened: To where she felt the Jewish state might not exist anymore. Numerous violations of the United Nations Nuclear non- proliferation agreements, regarding the use of nuclear weapons, continue to occur against Syria, with Israel as the aggressor, supposedly in self-defense of Israel’s “right to exist”. Israel’s policies from day one of their existence, courtesy of the UN, have always included the obscenity of the Sampson-Principle of bring the whole world down on all our heads if Israel does not get everything she demands from the world. Israel is clearly in violation of UN and IAEA resolutions, in each and every case. The UN should evict Israel from the United Nations. The world should sanction Israel (and USI) for their global-crimes. Israel must be cut-off from any part in the community of nations, unless Israel immediately invites the IAEA and the United Nations to inspect Israel’s nuclear weapons programs publicly. Of course this seems impossible to actually do. But if the world continues to lack the testosterone to do what must be done then we’ll need to prepare to be attacked by Israel, with nuclear weapons. This non-choice should be the only global topic under discussion: Because each deadly act is now directly traceable back to Israel and to our enthusiastic-support for that rabid-outlaw-state—which includes the destruction of whatever is left of the U.S. as well. 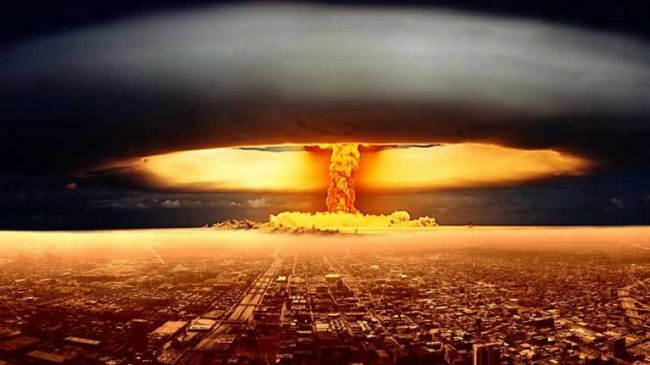 The world must spit in the face of Benjamin Netanyahu and Barrack Obama—if any of us is to have a world any longer in which most of the people can still survive and Stop Armageddon!